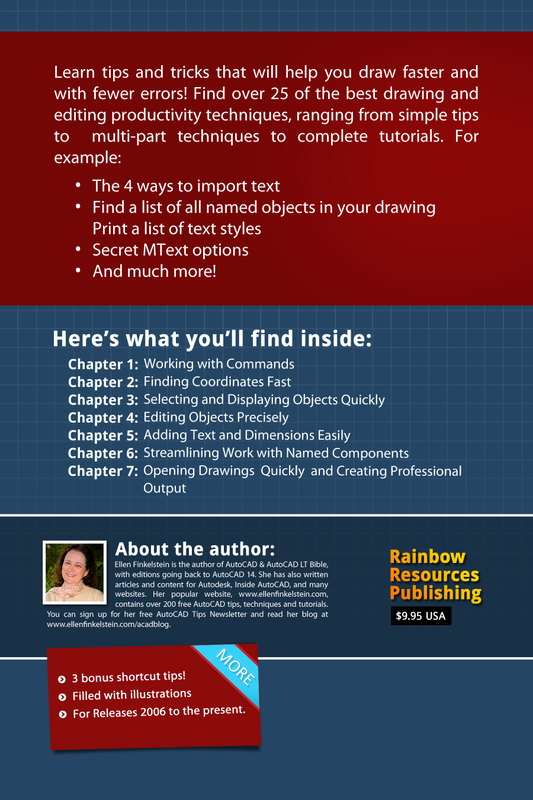 This 50+ page ebook will make your drawing and editing go more smoothly and quickly. Learn from AutoCAD expert Ellen Finkelstein, with the help of submitted tips from many others around the world. About Ellen Finkelstein Ellen Finkelstein has been using AutoCAD since 1986, teaching it since 1989 and writing about it since 1992. She is the author of the best-selling AutoCAD & AutoCAD LT Bible, which started with Release 14. Ellen has written extensively on AutoCAD, including articles for Autodesk’s website and features for AutoCAD’s Help system. Ellen’s first book was AutoCAD For Dummies Quick Reference.